Pistorius siblings: 'Truth manipulated' Jump to media player The siblings of Oscar Pistorius,, Carl and Aimee Pistorius, speak of "twisted truths" in a television interview ahead of his sentencing on Tuesday. Why is Pistorius sentence delayed? Jump to media player Oscar Pistorius was convicted of culpable homicide over the shooting of Reeva Steenkamp in September but is yet to be sentenced. Oscar Pistorius has bail extended Jump to media player South African athlete Oscar Pistorius has been found guilty of culpable homicide after the judge found he killed his girlfriend by mistake and he has had his bail extended. Pistorius leaves court after verdicts Jump to media player South African athlete Oscar Pistorius has left court on bail after being found guilty of culpable homicide. Pistorius' 'mendacity and deceitfulness' Jump to media player The prosecution in the murder trial of Oscar Pistorius has been presenting the final arguments claiming the testimony of the 27-year-old athlete is inconsistent. The siblings of Oscar Pistorius have spoken on the eve of his sentencing for the culpable homicide of his girlfriend Reeva Steenkamp on Valentine's day 2013. 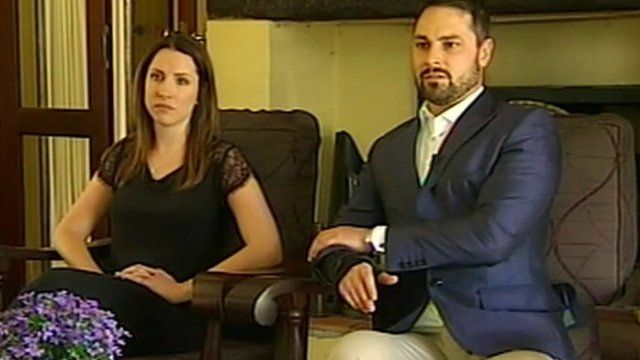 In the television interview, Carl and Aimee Pistorius speak of the burden of public exposure in the 20 months since the shooting. Aimee Pistorius said that "her brother would carry this with him for the rest of his life". Go to next video: Why is Pistorius sentence delayed?